ATLANTA - October 11, 2013 - Hosted by superstars Amy Grant and Kirk Franklin, the 44th Annual GMA Dove Awards, the Gospel Music Association (GMA)'s annual celebration of the inspirational message and artistry of Gospel and Christian music, will tape live from Nashville's Lipscomb University and make its television premiere on Monday, October 21 at 8 p.m. EDT on UP. This marks the fifth year that UP has telecast the awards show. This year's event will be headlined by all-new performances and collaborations by NEEDTOBREATHE, Gaither Vocal Band, Jason Crabb, Michael W. Smith, Newsboys, Tamela Mann and TobyMac. Capital Kings, Colton Dixon, for King & Country, Passion Band featuring Kristian Stanfill and Brian & Jenn Johnson, Rhett Walker Band, Tasha Cobbs, Britt Nicole, Trip Lee, KB, Andy Mineo, Ernie Haase & Signature Sound, The Isaacs and Karen Peck will also perform. Presenters will include Candace Cameron Bure, Rusty & Julie Bulloch, Pastor Rick Warren, Joyce Meyer, Brandon Heath, Chonda Pierce, David Mann, Isaac Carree, Jaci Velasquez, Lecrae, Bart Millard, Mandisa, Montell Jordan, Jon Foreman, Mark Lowry and Bone Hampton. "As a network dedicated to uplifting entertainment, we are proud to again partner with the Gospel Music Association to telecast this year's extraordinary 44th Annual GMA Dove Awards," said Charles Humbard, president and CEO, UP Entertainment LLC. "This year's event promises to be spectacularly entertaining and inspiring as all the biggest names in Christian and Gospel music come together to celebrate all the various styles of this genre. There is no other network dedicated to showcase this prestigious musical celebration than UP. We promise an exhilarating evening of can't-miss performances, laughs, surprises and entertainment the entire family will enjoy." This year, awards will be given out in 42 categories voted on by the GMA membership. Nominations go to recordings released during the eligibility period of Nov. 1, 2011 through April 30, 2013. For the first time, GMA added a feature film category this year in response to the rise in prominence and impact of inspirational films within the entertainment community. 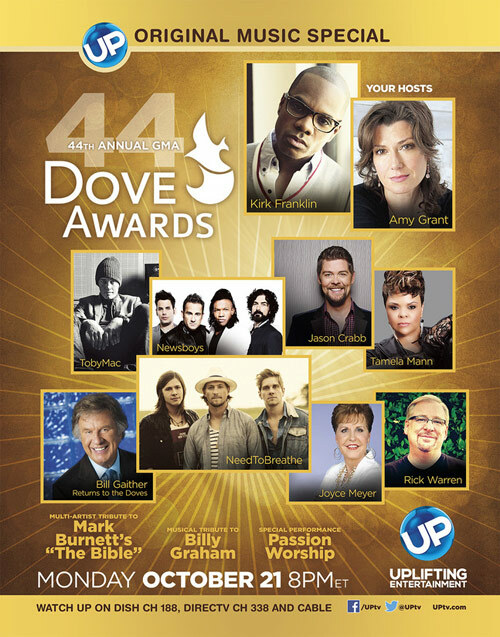 The complete list of nominees is available at www.doveawards.com. Founded in 1964, the Gospel Music Association serves as the face and voice for the Gospel/Christian music community and is dedicated to exposing, promoting and celebrating the Gospel through music of all styles including Pop, Rock, Praise & Worship, Urban Gospel, R&B, Hip Hop, Southern Gospel, Bluegrass, Country and more. The GMA community includes agents, artists, church leaders, managers, promoters, radio personnel, record company executives, retailers, songwriters and other industry visionaries. The GMA produces the GMA Dove Awards and IMMERSE. For more on supporting the GMA or becoming a member, please visit www.gospelmusic.org or contact the GMA directly at 615.277.1376. Follow the GMA on Facebook at www.facebook.com/gospelmusicassociation.